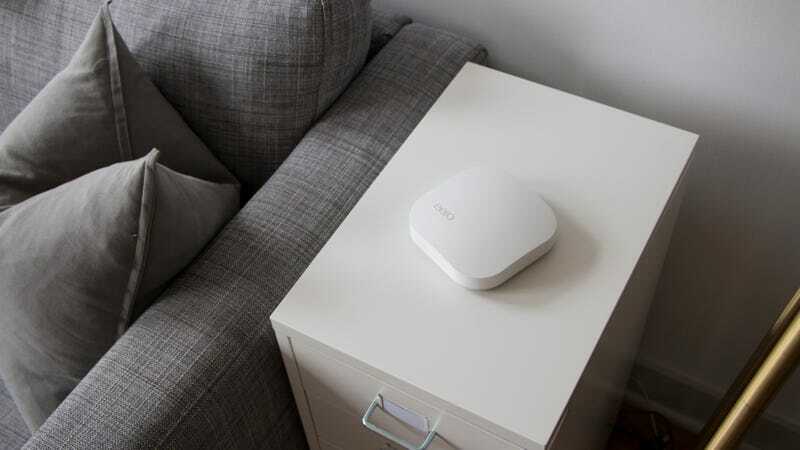 Up until about a few minutes ago, Eero’s mesh networking system was our recommendation for filling a large home with reliable, fast, and easy to use wifi. But now that Amazon has just announced it’s acquiring the company, it might not be a bad idea to put your wi-fi upgrade plans on hold until we see what Bezos has in mind for your wireless network. As our homes and the random gadgets that power it continue to get smarter, there’s been increasing demand on the wireless networks that keep everything connected to the internet. Mesh networking has, so far, been the answer to keeping the influx of wifi-connected devices running smoothly and playing nicely together, and Eero does a better job than most at keeping the router and its nodes easy to set up and manage, as we found in our review—as long as you don’t mind paying a premium for the hardware. So what will change once Amazon’s acquisition of Eero is finalized? There are, not surprisingly, few details in Amazon’s official press release, aside from the companies’ CEOs and SVPs complimenting each other. Will Amazon maintain the brand, which isn’t as quite a household name as companies like Linksys or D-Link have grown to become, or will Eero eventually join the Echo family? Asking Alexa to help you easily connect a new smart device to your wireless network would undoubtedly be convenient, but as we recently discovered, it’s all but impossible to block Amazon from your life, so do you really want to open another giant door for the online retailer to enter your home?